Set in a 30's style noir world filled with ghosts, ghouls, skunk-apes, extra-dimensional aliens, and mad scientists, a muscle-bound brawler claims to be the primary enforcer for the feared mobster Labrazio. 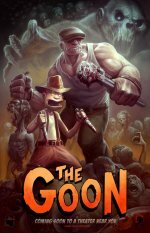 The Goon and his sidekick Franky get involved in various machinations, often in relation to the evil zombie gangs under the command of the Nameless Zombie Priest. Eric Powell will adapt from his comic book series published by Dark Horse Comics. This will be developed as a CG animated feature film.